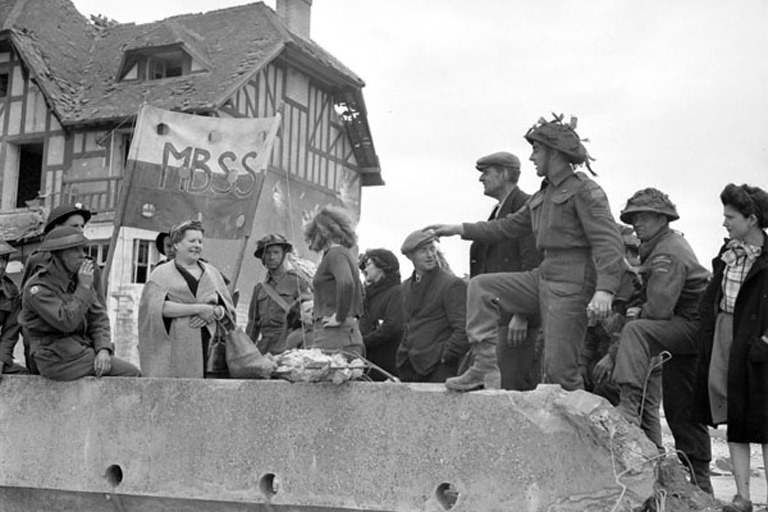 Canadian soldiers speak to liberated French citizens at Bernières-sur-Mer, France, in June 1944. the house that became La Maison des Canadiens is seen in the background. For ninety years, a house has overlooked the beach at Bernières-sur-Mer, France. A stately two-storey summer home, it stands alone, looking toward England across the cold English Channel. It wasn’t built by Canadians, and Canadians don’t own it. But on a stormy morning in June 1944 it became an unforgettable part of Canadian history. 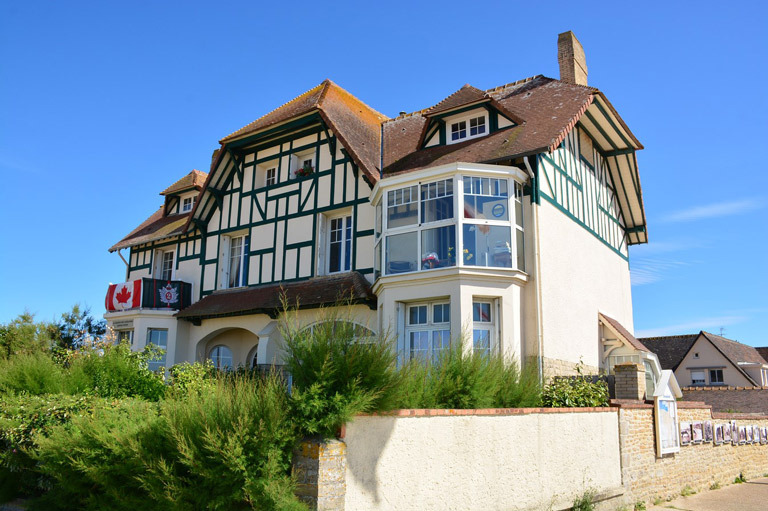 La Maison des Canadiens — or Canada House, in English — is an iconic landmark in this village on the Normandy Coast. On June 6, 1944, it became the first house to be liberated during Operation Overlord, the Allied invasion of France. Within twenty minutes of landing on the beach, the Queen’s Own Rifles of Canada had opened fire, pushing out the German soldiers who had claimed the house as their own. A French-Canadian unit, Le Régiment de la Chaudière, joined the fight shortly after that. In 1944 the house was a major landmark, appearing in D-Day photos and grainy film footage viewed across the country. More than one hundred Canadians were killed on the beach in front of the building during the first few minutes of the battle. “Almost every Canadian that landed on Juno Beach at that time saw the house,” said Gauthier Hebbelynck, president of L’Association la Maison des Canadiens. La Maison des Canadiens today. This past year, however, the house lost its staunchest supporter. For more than forty years, Herve Hoffer — who owned the house with his wife, Nicole Hoffer — had welcomed visitors and shared stories of the famous house. The house was built in 1928 as a summer vacation home for Leon Enault, a Parisian department store director. Enault had the house constructed as a duplex so that it could be split equally with his grandchildren, Denise and Roger Videcop. And for years, before the start of the war, the house was named after them, Villa Denise et Roger. They had no interest in it, however, and in 1936 both sides were sold. One was bought by Edmond Hoffer, a doctor from Le Havre, France. His wife operated a teahouse around the corner, and they dreamed of a future where their children’s children would one day enjoy the home. But on September 1, 1939, the Second World War began. By June 1940, the Germans controlled much of France, including Bernières-sur-Mer. The beach had become a military zone under German occupation. Civilians were forbidden to enter the zone, and most homes (and the teahouse) were destroyed, giving the Germans a better view of the channel. No one knows exactly why the Hoffer house was not torn down during those years. Some say it’s because it wasn’t within the firing lines of the German anti-aircraft guns. Others say it’s because a German officer took a liking to the stately structure and wanted to make it his base. It took several years for the home to be rebuilt after the war, and Herve Hoffer took it over after his grandfather died. As the fortieth anniversary of D-Day grew closer, the family noticed that more Canadian veterans were coming to revisit the place that had been such a pivotal part of their lives. The Hoffers welcomed them, every time. Over the years, Hoffer amassed myriad historical photos and mementos, including a Nazi armband left behind during the retreat and a bloodstained French franc given to Hoffer by a Canadian veteran who had received it from a wounded German soldier in return for sparing his life. Canadian Terri Kubik was at the house in 2009 when Canadian veteran Ernie Kells stopped by. Herve Hoffer, Kubik explained, believed that his family may not still have existed today had it not been for the Canadians in 1944. Kubik, who is from Ontario, became friends with the Hoffers in 2003 during the opening of the Juno Beach Centre, Canada’s Second World War museum in Courseulles-sur-Mer. A board member of the L’Association la Maison des Canadiens, she now travels regularly to France, giving tours when visitors — there are many — stop in. “It’s unlike any history lesson you’ll get in school, unlike anything we learned about any kind of war, really,” she said. What will happen now that Herve has passed away? The right-hand side of the duplex is owned by a different family and is not open to the public. Herve’s wife and sons hope to continue the Hoffer legacy of welcoming visitors to the home, said Hebbelynck. Ultimately, they hope to turn their half of the building into a museum. The Hoffers believe many in the town support their vision; following Herve’s death, the street behind the house was renamed in his honour. Hebbelynck recalls an elderly man who visited a couple of years ago. He was quiet, just looking out the window toward the beach. “I asked him, ‘How did it feel to be here, almost at the end of the war?’ ” Hebbelynck said. The old man turned around and stared. “I wake up every night and I see the faces of the men who didn’t make it,” he told Hebbelynck.